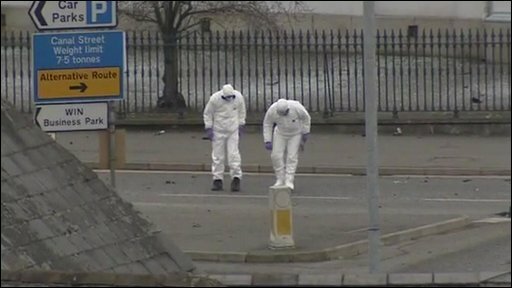 Police say it is a "miracle" no-one was killed or injured in a car bomb explosion at Newry courthouse. Officers were evacuating the area when the bomb went off in New Street at about 2200 GMT on Monday. The explosion damaged the gates of the courthouse. Dissident republicans opposed to the peace process are being blamed for the attack. There is severe traffic disruption in Newry as the area remains cordoned off and a security operation continues. Police Chief Inspector Sam Cordnor said: "It is only by sheer miracle that nobody was killed or injured." The Newry bomb attack is the most serious incident involving dissident republicans in Northern Ireland since the recent political breakthrough at Hillsborough Castle. The dissidents are making it clear they want to wreck any political progress. Politicians at Stormont will be disappointed and disgusted at the bomb attack - but they won't be surprised. Gradually in recent weeks, the dissidents have been stepping up their activities. Since they tried to kill a Catholic police officer, Peader Heffron, in Co Antrim last month, they've targeted three police stations in Co Armagh and now they've exploded a bomb in Co Down. By striking in three different counties, they are trying to increase the range and intensity of their violence. But they still have very little support and a limited amount of weaponry. Without that, they cannot mount a full-scale campaign. The attack comes days after a mortar bomb was abandoned near a police station in the village of Keady, about 20 miles away. The bomb attack is thought to be the first time a large car bomb has exploded in Northern Ireland since an attack on Stewartstown police station in 2000. In the last few years a number of large car bombs been have planted but have either failed to detonate or only partially detonated. There have also been several attacks with smaller under-car bombs such as the one which almost killed a police officer in County Antrim in January. BBC NI Home Affairs correspondent Vincent Kearney said police had been bracing themselves for some kind of response to the Hillsborough Agreement, signed just over two weeks ago. "The fact that it has taken them so long to respond tells us something about their capabilities," he said. Northern Ireland Secretary Shaun Woodward said: "This is an appalling attack by a very small group of people who refuse to accept that peace is working in Northern Ireland." Sinn Fein MP for Newry and Armagh Conor Murphy said: "The fact that we're in the process of devolving policing and justice powers and there's an attack on a courthouse will not be lost on people. NI Secretary Shaun Woodward: "This is an appalling attack"
"These people are trying to drag us backwards and ensure we have the British army back on the streets." DUP MLA William Irwin said the bomb was "a cowardly action by those who want to drag Northern Ireland back to the past". SDLP MLA Dominic Bradley said: "People are saying that they got enough of this sort of thing during the Provo campaign, it was wrong and senseless then and it is wrong now." 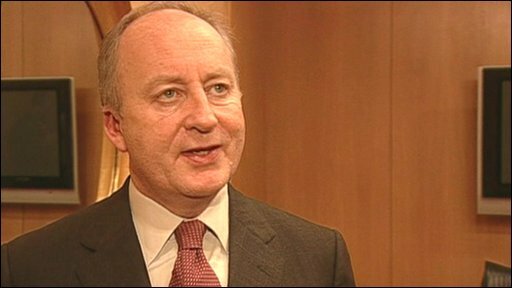 Ulster Unionist assembly member Danny Kennedy said the bomb was "proof of a deteriorating security situation in Northern Ireland". "It represents a clear attack on security services and government institutions. It shows a very worrying level of capability that these dissidents now have."